Berta Rosenbaum Golahny was born in 1925 into a socially-conscious, cultured family in Detroit, Michigan. Her immigrant parents, Fannie Henkin Rosenbaum (1889-1953) and Gedaliah Rosenbaum (1889-1985), imparted to their three children their faith in individual and group freedom, social justice, and concern for the needy. Fanny and Gedaliah also transmitted their esteem for appreciating and creating art. As a young child, Golahny began to draw while watching her father design wrought-iron pieces for the company he founded, Liberty Ironworks, whose ornamental gates and railings can still be seen in Detroit. At Detroit’s Cass Technical High School, a magnet school for the gifted, Golahny concentrated in painting. 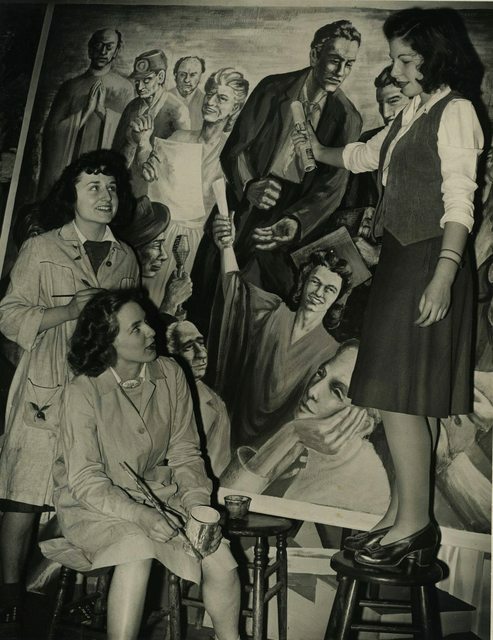 In 1943-4 Golahny attended the Art Students League in New York City, having received a National Scholastic Scholarship. Under the instruction of the French sculptor Ossip Zadkine, Golahny turned to sculpture. One of the pieces she created under Zadkine is of two mangled hands wrestling with each other, titled Struggle. Another is a woman’s naturalistic, contemplative head. Each of these works indicates a theme on which much of Golahny’s later work would focus: the hands indicate Golahny’s interest in resistance to suffering; the head attests to her fascination with consciousness and imagination. Golahny continued her studies at the Art Institute of Chicago, where her thesis painting, The Resurrection was awarded the Painting Prize by juror Ben Shahn. 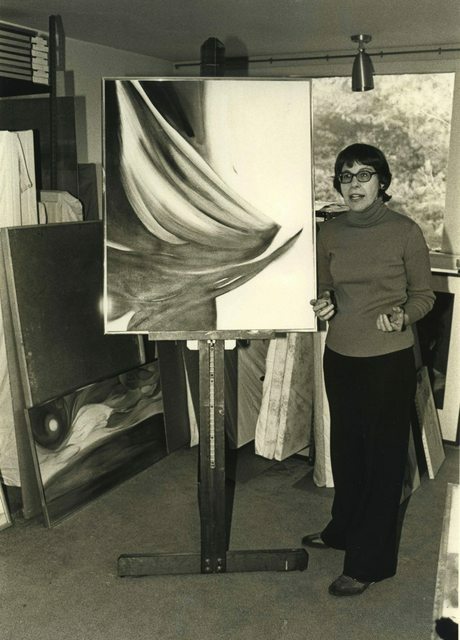 After receiving her Bachelor's in Fine Art from the Art Institute in 1947, Golahny completed her studies at the University of Iowa, from which she received a Master's in Fine Art in 1950. At Iowa, she studied printmaking under Mauricio Lasansky, art history under William S. Heckscher, and painting under Eugene Ludins. In 1951, she was awarded the Tiffany Foundation Fellowship for printmaking. 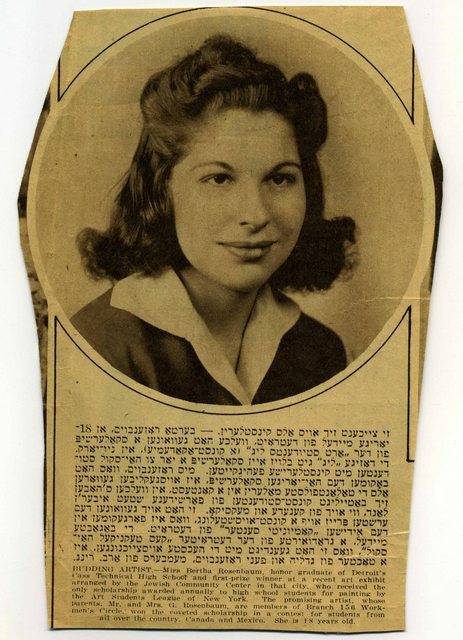 While at Iowa, she married Yehuda Golahny, an engineering student in Detroit. When Yehuda began to pursue a Master’s of Science in Electrical Engineering at MIT (class of 1954), the couple moved to Cambridge, Massachusetts. After two years, they moved to Newton, where they settled. 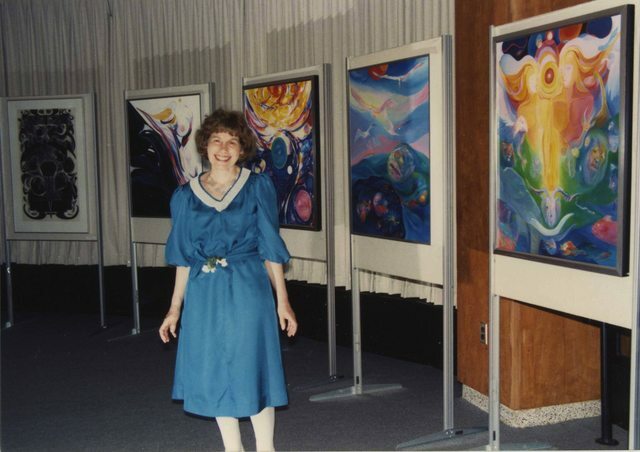 Berta Golahny participated in the art world nationally and locally. From 1959 to 2001, she taught at the Cambridge Center for Adult Education. Her devoted students, accomplished professionals in their own fields, took her painting classes on Monday nights, often continually for years. She exhibited nationally and internationally in several hundred juried and invitational shows. Today her work is held in private collections throughout America, France, and Israel, and in museums, among them the Fogg Art Museum at Harvard University, the Palmer Museum of Art at Pennsylvania State University, and the Library of Congress. A prolific painter and occasional sculptor, Golahny excelled in the traditional media of etching, wood engraving, and woodcut. She experimented with monotype, with various ways of biting the plate, and with electric tools to incise lines upon zinc and copper plates. The term that describes her best is peintre-graveur, coined around 1800 to refer to artists who were both painters and printmakers. The foremost of these was Rembrandt, who set a standard in printmaking for the rich tonal blacks that artists ever since have attempted to emulate. Golahny, in her etchings, achieved that tonal richness. In addition to Zadkine and Rembrandt, artists with whom Golahny found affinity include Max Beckmann, Paul Cezanne, Wassily Kandinsky, Paul Klee, Franz Marc, and Nicolas de Staël. Taken together, these artists have strong expressive qualities in the rendering of figures and nature. Of Cezanne, Golahny noted that “when he puts a stroke of paint on the canvas, it stays there.” The saturated colors of Marc and Kandinsky provided her with examples of brilliant and pure pigments; the playful creatures and inventions of Klee provided models of fantasy. Beckmann’s paintings of humanity under duress reinforced Golahny’s own efforts to represent suffering. Golahny’s earliest work reflects city life in Detroit, New York City, and Chicago: people on buses or trains, workers in factories, and children at play. She responded to global tragedy, such as World War II, the Korean War, Biafra, the threat of nuclear war, and recent terrorism. She portrayed the realities of these tragedies, often modeling an image on a photograph from the New York Times, and depicted also the imagined consequences of these tragedies. She rendered the earth's landscape, as for instance the stunning mountains of Sinai, the knobby olive trees of Israel, and the contorted roots of a Massachusetts oak. And she explored in her art what lies beyond the earth, in the wider realm of the cosmos: nebulae, galaxies, and black holes. Each theme she approached in various media, to achieve diverse pictorial and expressive effects. Golahny worked in series. One series, begun around 1964 with a multi-block color woodcut, was titled Landscape of Man in the Nuclear Age. She continued this series in intaglio, painting, wood engraving, and copper engraving, completing it in 1988. What grounds each image in the series is a central column of three faces, the middle face shutting his eyes tight so as not to see the destruction around him. Several images in the series also feature an embracing arm to the right side of the column, shielding many figures from harm. A visit to a mid-west state fair inspired an intaglio print of 1949 titled Children at the Fair: The Ride. Golahny reprised this composition of a whirligig (a central pole with carts swinging from it) in a 1987 woodcut and in several subsequent large paintings. Inspired by early publications on nebulae and black holes, Golahny began the Space series in 1980. In dozens of paintings she recreated the convulsive and bubbling activity of distant galaxies, modeling her images on the photographs and reports of cosmic exploration in the archives of the Harvard College Observatory, Cambridge, Massachusetts. 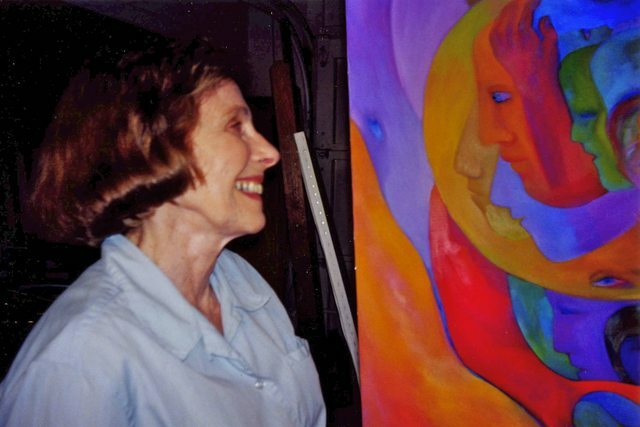 She also painted evocative layerings of an imagined passage through space and time, and fantastic semi-formed creatures that exist in a life outside of our experience. The Being and Becoming series concerns the expansion of the universe since the Big Bang. Works in this series represent the continuous creative processes of the universe, a process that culminates in the emergence of the human being as a cognitive individual. Several pieces are structured around the shape of a “V,” which symbolizes outward movement from the initial Big Bang. 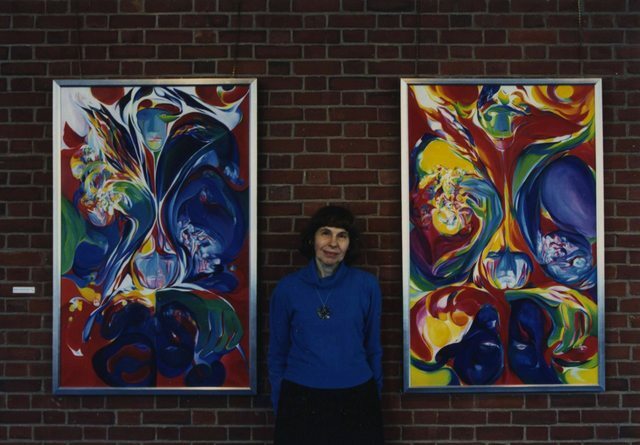 Inspired by this series and other paintings, Boston-based musicians Paul and Rosalie DiCrescenzo wrote a four-movement score to accompany a slide-show of the images, titled The Watchers and the Watched. This was performed with support from the Massachusetts Council on the Arts in 1995. And it was performed again, at the Newton Free Library in December 2006, as part of a commemoration of Golahny’s life and work. Throughout her seven decades of work, Golahny explored the place of humanity in the infinite universe, and expressed empathy for people caught up in historical catastrophe. Her response to the World Trade Center attacks of September 11, 2001 was to paint two large canvases in a series called The Striving. In the second painting, her last, ladder-like towers lean but do not fall, surrounded on one side by the thoughtful, diverse faces of those affected by September 11th , and on the other by sufferers of past tragedies. Next to the towers, at the painting’s center, an African American basketball player leaps to make a basket, touching a haloed, globe-like ball to which the towers seem to point.